If you have your own business and want to make your business secure then ACH Payment Processing is the best means offered by eMerchant Pro for the merchants to make their business work in a proper manner. 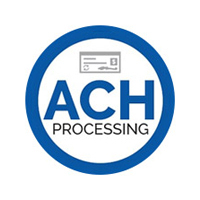 ACH or Automated Clearing House is a system that systematizes electronic payments besides automatic cash transfers. ACH is the low-priced service offered by eMerchant Pro in making your business come to the forefront. ACH mode of payment offers an inexpensive way to transact the payment from customers to the merchants. ! ACH Payment Processing is the easiest way to obtain payment online with the aid of eMerchant Pro. With our services, the processes are quite simple for the merchants seeking online payment from the customers. You do not need to use paper checks, credit card networks or any other modes of payment. Here the electronic payment is done from your account employing your checking account info. In order to transfer funds to or transferring funds from your account, you need to approve those transfers and there should be your account number and routing numbers. ACH is the simplest process among all means of transactions. ACH Payment Processing is the fastest means of payment as compared to other modes of payment as compared to other payment processes. If you are running an online business, ACH by eMerchant Pro offers a speedy solution to your business transactions. There is no delay in payment from your customers as you avail immediate transaction process. ACH Payment Processing is the safe and secure payment process as you do not have to wait for your revenue to arrive at your account. The process arrives at the merchant‘s account from a customer’s account without a worry. Make your business safe and secure with ACH payment and gain enormous benefits! Businesses must be careful about any sort of fraud and thus ACH Payment Processing is the best means for payment and thus consumers enjoy a high level of satisfaction against any sort of fraud in checking their accounts. ACH process is quite reliable as it safeguards the amount from any sort of fraud and scam that is possible through credit cards or any other means of payment. A payment gateway solution from eMerchant Pro is quite beneficial for the merchants. ACH payment aids to fulfill with PCI DSS and are NACHA acquiescent, assure the highest security to defend merchants, businesses including the customers from ACH fraud. ACH payment process aids in protecting from all types of frauds in transaction processes on the way. One is Direct Deposit and the other one is Direct Payments. Direct Deposits are payments that are made to a recipient like a salary from your employer. In Direct Payments, there are requests to pull amount from an account. Direct Payments take place while you deposit utility bills in an automatic manner through your checking account. Businesses need to buy software if they are looking for ACH means of payment from customers. eMerchant Pro offers a unique tool that can make your payment processes work in a fine manner. With payment gateway solutions your business can work aptly without any delay and the money is transferred instantly from payer to payees account without hassles. The payment gateway serves a path to make your business transaction work efficiently. Want a merchant account; obtain ACH payment gateway solutions for your running business!